Main Rate is applicable for a 2 year /24 month term deposit for a balance between $100,000 and $499,999. Interest paid at maturity/annually with other monthly and semi annual options available. The interest rates applicable for this 2 year term product is for interest paid annually for $250,000 to $5,000,000. Please Note: Other deposit products include options for interest paid monthly and half yearly. This two year TD rate is paid annually or at maturity for balances less than 2 million but greater than 50,000. It also available paid 6 monthly/Semi-annually as well as monthly (4 weekly). CBA has a tiered month range for this product that various from 24 to 33 months. 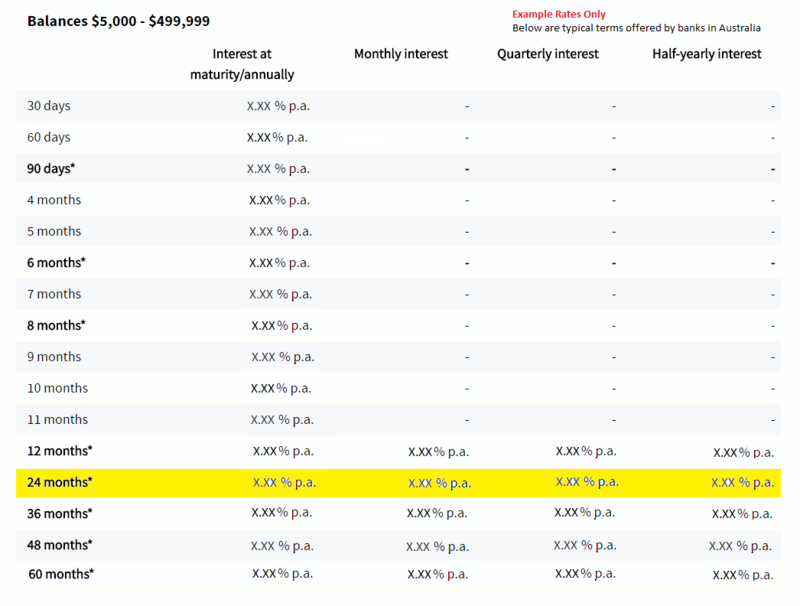 Rate is available for amounts from $5,000 to $99,999 at an annual interest maturity. Term is 24 - 35 months. A deposit for a 2Y or 24 month maturity is a common medium term based deposit product offered by banks for its retail customers. It can be paid annually or semi annually depending on the bank offering.